This paper aims to investigate the compression and pore characteristics of underlying stratum in landfill. Batch tests were conducted to measure the compressibility as well as the pore, mineral, and microstructure characteristics of the undisturbed loess polluted by landfill leachate under different concentrations. Results show that the compressibility and compressive deformation of undisturbed soil increased as the landfill leachate concentrations increased. The reduction range of the void ratio was from 22.1% to 30.8%. The leachate pollution caused a decrease in the content of illite and montmorillonite, which reduced by 4.59% and 3.8%, respectively. The NMR signal of undisturbed soil increased as the landfill leachate concentrations increased. The pore radius of the undisturbed soil was mainly distributed in the range of 0.01–1 μm and can be divided into two ranges. The inter-particle pores and intra-aggregate pores mainly existed in undisturbed soil polluted by landfill leachate. Leachate caused an increase in inter-particle pore, whereas a decrease in intra-aggregate pore radius. H. Lu—Contributed equally to this work and should be considered co-first author. 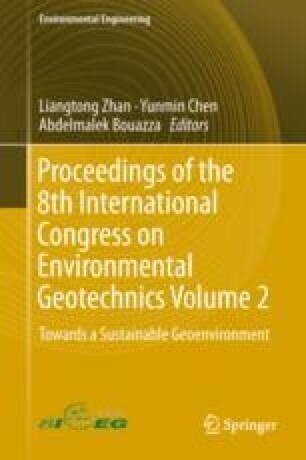 The authors would like to express their great appreciation for funding provided by the “National Natural Science Foundation of China (11672216, 11602183).